It’s difficult to figure out what to do with older computers that no longer have a purpose in your office. You can sell them or give them away to your employees- it’s a great way to repurpose equipment that might not be useful to you, but would still be useful to someone. What steps did you take to ensure that you didn’t accidentally provide company files and information that’s critical to your business? Sometimes the answer is that it was reformatted, while other times the hard drive was replaced by a hard drive from a computer with no critical business information. We’ve even come across businesses or government information that didn’t even think to erase their data at all. There’s no real 100% correct answer here- but there is a lot of confusion about what it means and what it takes to erase information from a hard drive. The first thing we recommend is to replace the hard drive of any computer that has sensitive information or business information. Then, you need to make sure to dispose of that hard drive properly- or at least take steps to ensure that the data that was on the drive can no longer be recovered. To ensure your data is properly destroyed, two main methods are used: A software solution that overwrites the data on the hard drive dozens of times to make sure it’s not recoverable, or you can use mechanical destruction, which turns your hard drive into thousands of pieces of metal, plastic, and electronic components. This article will help define each of these methods, and provide you with several options that help guarantee that your hard drive will never be accessed again. If you plan to sell or re-use the hard drive(s) that need to be erased, a software solution might be your best bet. There are tons of software solutions that claim to overwrite and/or “wipe” your hard drive. There’s a lot of variables when you’re choosing the software that will completely remove all data from drive without damaging it- certain programs only work with certain types of hard drives (i.e. SATA or IDE), and some of them require an external drive to run the program (which most new computers might not have). This type of software eliminates the ability to retrieve data using standard operating system commands and methods, or traditional recovery methods by writing meaningless patterns of data onto each of the hard drive’s sectors. We’re not well versed in helping you find the proper software to wipe a drive- we’re in the hard drive destruction business. But we found an article that has some great insight into what to look for when choosing a software program to wipe your hard drive. You can check it out here. We did do our homework and found some of the most popular (and most reliable) data wiping software programs for you. This open-source program developed by Sourceforge is one of the most popular and reliable data destruction programs that we could find. It can boot from a cd/dvd, usb stick, or even without an external source if you know how to do it. It completely deletes any data on a hard drive- so if you’re looking for a free solution that will remove everything from your hard drive, this is your best bet. Although it software that you have to purchase, Blancco is another highly recommended data erasure tool that can be used on home computers as well as network servers and even individual files. They have millions of customers throughout the world- and since they have programs that have the ability to erase hard drives that usually contain business files, it could be an ideal software solution for businesses. Eraser is another open-source software program that gives you the ability to add tasks to securely erase selected files and folders, any free space on your computer, and even the recycling bin. This program offers several different ways to overwrite your data to give you more control of how your data is erased if that’s a critical element in your decision process. It also has an easy to use interface and a task scheduler, so you can routinely delete certain files or folders at regular intervals. Data wiping software is a great way to ensure that your data is removed- but if you don’t do the proper research and select a software system that doesn’t perform like the ones we mentioned above, you still could be at risk for a data breach. If you want to be 100% sure your data isn’t compromised, you should consider mechanical destruction of all your hard drives. 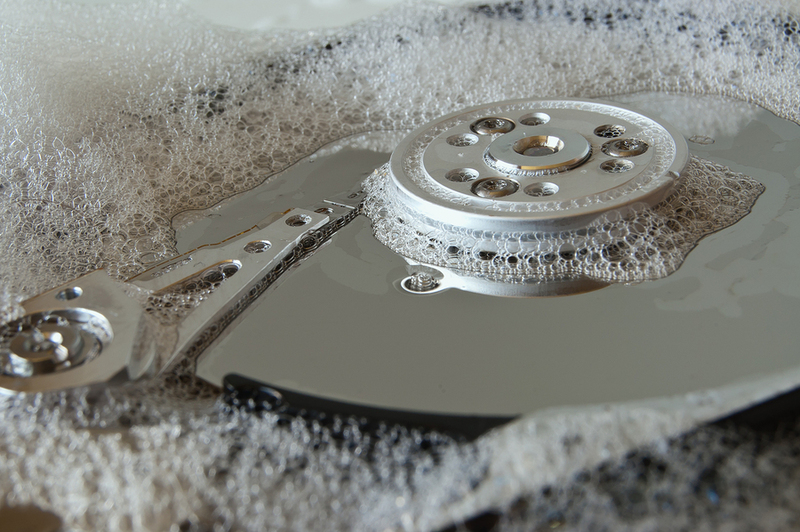 Mechanical or physical hard drive destruction is pretty easy to understand- to make sure your data can never be recovered, you need to eliminate any chance of someone gaining access to it. Here are the methods we employ either individually or as a whole depending on how sensitive your data is and how much you want to guarantee destruction. Degaussing uses an electromagnetic field to destroy data on a hard drive. This field, usually generated by a machine, renders a hard drive completely unreadable. Any hard drive stores information by setting up a field on a small piece of the drive to represent a 1 or a 0. Degaussing a hard drive messes up the order of this data and makes it completely unreadable. A certified electronic media destruction company that specializes in hard drive destruction that has a degaussing machine that adheres to NSA and DoD standards to ensure your data is no longer accessible. Hard drive shredding guarantees that your hard drive will never be accessed again- in fact, it turns your hard drive into thousands of tiny pieces. Hard drive destruction companies have industrial shredders that can destroy just about anything- but to ensure your data wasn’t compromised, they take additional steps to ensure your data is secure up until the point it is shredded. All drives are secured in locked bins, and can even be monitored via video surveillance to keep the chain of custody intact. A hard drive crushing machine breaks the platters that store information on drive (along with the rest of the hard drive). Since the drive isn’t necessarily 100% destroyed like it could be in a hard drive shredder, it’s an effective method for destroying a drive, but might not be as secure as some of the other methods listed here. Another advantage of hard drive crushing is that it’s portable and a less expensive piece of equipment compared to other hard drive destruction machines. You can purchase or rent one, or a professional shredding company can bring it on site to your company. Keep in mind that doing any kind of hard drive destruction (or any internal electronic or document destruction) has its risks. Here’s where it gets interesting. 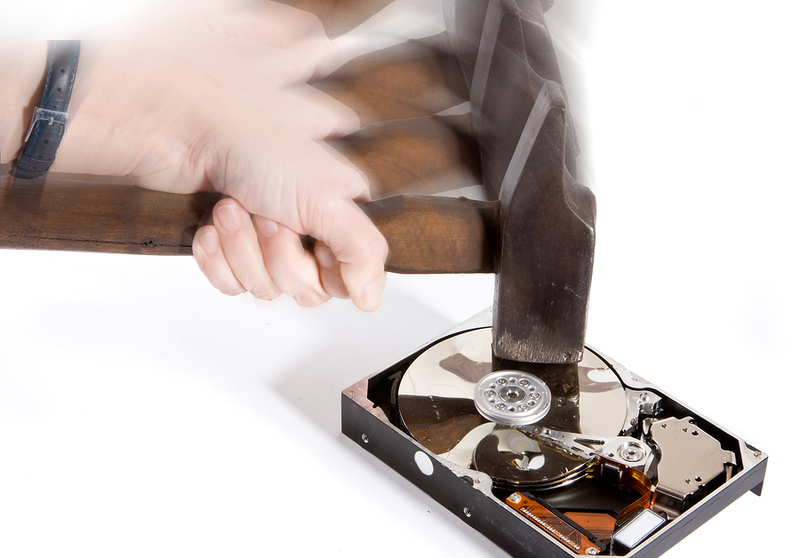 We’ll list a few things here, but we do not recommend that you destroy your hard drive using any of these methods. Don’t take a risk of injuring yourself or others, or assume that just because it looks destroyed that the data can’t be accessed. 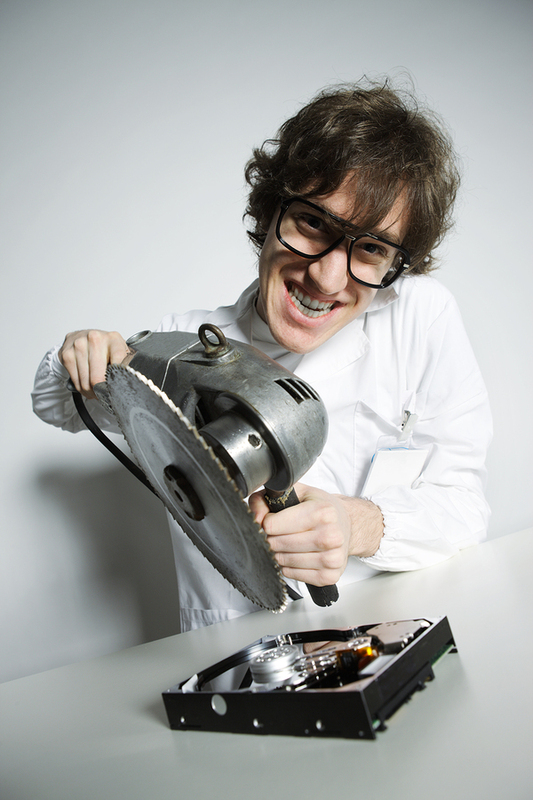 Some of the more interesting ways to destroy a hard drive are listed below. Wiping vs. Mechanical Destruction- What works best? If you want a guarantee that no one will recover your data, the best method is: all of the above. Any time electronic equipment that stores data leaves the premises permanently, it should be wiped with a software program that ensures the data is completely erased. If you’re sending it to be destroyed, you should have the electronic media destruction company degauss it before it’s shredded or crushed. That way, you have taken every known method possible to ensure that even a piece of that destroyed hard drive will be completely unusable. Do you need hard drive destruction services? Shred Nations can Help! Shred Nations offers hard drive destruction and/or shredding services that ensures all data on your drives are completely unrecoverable. Our trained staff of specialists that can help you decide what the best course of action is for your secure hard drive destruction project. Shred Nations has a network of contractors that allows us to come to your location if you need to ensure a proper chain of custody, or we offer the ability to have you ship your drives to a secure facility to be destroyed. We also provide a certificate of destruction that details when and where the hard drive was destroyed. The bits are separated into component parts and recycled. If you just have a few drives to destroy you can save money with our Ship ‘n’ Shred for hard drives.